It’s widely-known that regular exercise is vital to a healthy lifestyle, but how much exercise do we really need to stay healthy? The answer to that question mostly depends on how old you are and what type of exercises you are physically able to perform. The average adult between the ages of 18 to 64 should participate in 2 hours and 30 minutes worth of moderate-intensity aerobic exercise every single week, according to the Centers for Disease Control and Prevention. That’s a lot of exercise! Most people don’t get anywhere close to that amount of exercise unless they pick up the habit of exercising 30 minutes a day, five days a week. What do we mean by aerobic exercise? We mean cardio exercise where you’re breathing hard and even sweating. 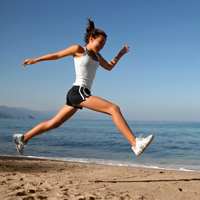 Moderate aerobic exercise is equivalent to brisk walking, riding a bike across a level surface or water aerobics. In addition to this moderate-intensity aerobic exercise, adults should participate in muscle-strengthening exercises two or more days a week that work every major muscle group, including your legs, arms, back, abdominals and chest. Adults do have an alternative to this, however. Instead of getting two and a half hours of moderate aerobic exercise every week, they can substitute an hour and 15 minutes worth of vigorous-intensity aerobic exercise. Vigorous cardio really gets your blood pumping and can be accomplished by running, jogging, swimming laps, or playing basketball. With this level of intensity, you’ll be able to work out about 15 minutes a day, five days a week instead of 30 minutes a day with moderate cardio. Just don’t forget to do muscle-strengthening activities, like weights and resistance workouts, at least two days a week as well. Childhood obesity is on the rise, and one of the best things you can do as a parent is make sure your child stays active from a young age. Children aged 6 to 17 need an hour of physical activity every day, according to the CDC. This activity should be mostly aerobic exercise but should also include muscle-strengthening exercises three days a week. Putting your child in gymnastics or extracurricular sports is a great way to make sure they get in the physical activity they need — and it keeps them having fun! For as long as they are able, adults who are 65 and older need the same amount of exercise as a younger adult, according to the CDC. However that doesn’t mean you have to do the same types of exercises. Older adults with limiting health conditions should consult with their doctor about the type of exercise that is best-suited for their body. For example, if older adults have trouble getting 30 minutes of exercise in at one sitting, they can split it up by doing a 15-minute brisk walk in the morning and a 15-minute brisk walk in the evening. This article is written by Kitty Holman, who specializes in writing about nursing colleges. Questions and comments can be sent to: kitty.holman20@gmail.com.